This brand new picture frame is manufactured in the USA at our facility in Ithaca, Michigan using the best materials and tools available. Our picture and poster frames LARGER THAN OR EQUAL TO 12x18 inches (inside dimensions) include clear STYRENE facing, a rigid cardboard backing and hanging hardware. Some assembly is required to attach the hanging hardware to the frame. Visit our seller info page for assembly instructions. Hanging hardware includes: (2) 1" Nails, (1) 30# capacity Wall Hanger, (1) 4' length of Hanging Wire, (2) D-Rings, (2) 1/2" Screws. Before hanging your frame, please remember to peel off the blue protective film from the styrene facing (or acrylic facing if you upgraded) for maximum clarity. Our picture frames will compliment any space that you hang them in, they make great gifts and they will protect and display your photographs and artwork for years to come. If you have any questions or comments, please do not hesitate to contact us. Feel free to visit our storefront and seller info pages to browse our extensive selection of frames, read customer feedback or review our policies and contact info. At the end of the day we want you to be completely happy with your purchase. Be sure to add us to your list of favorites so you can easily find us the next time you need a quality picture frame. Thank you for shopping with us. 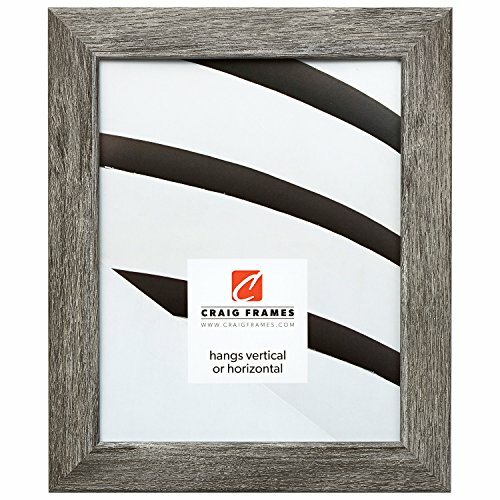 We are Craig Frames and we are framing the world...one customer at a time. Frame moulding is 1.26 inches wide, Wood composite material.